GRAFENWOEHR, Germany — Bavaria, we have just received funding to begin major renovation and construction projects on Tower Barracks. The most current project near the Grafenwoehr Elementary School (GES) will ensure the health and safety of our children. This project, however, will be a temporary inconvenience. Expect construction near GES beginning Tuesday, Sept. 5 for three to four weeks. As a matter of child and community safety, traffic along the GES portion of Gettysburg Avenue will be restricted to school buses during school pick-up and drop-off from 7:45 – 8:30 a.m. and 2:15 – 3 p.m.(1:15 – 2 p.m. on Thursdays for early dismissal). During these times, access to buildings in the area, such as the Post Office, USO, Community Bank, Service Credit Union and the chapel, will be limited. 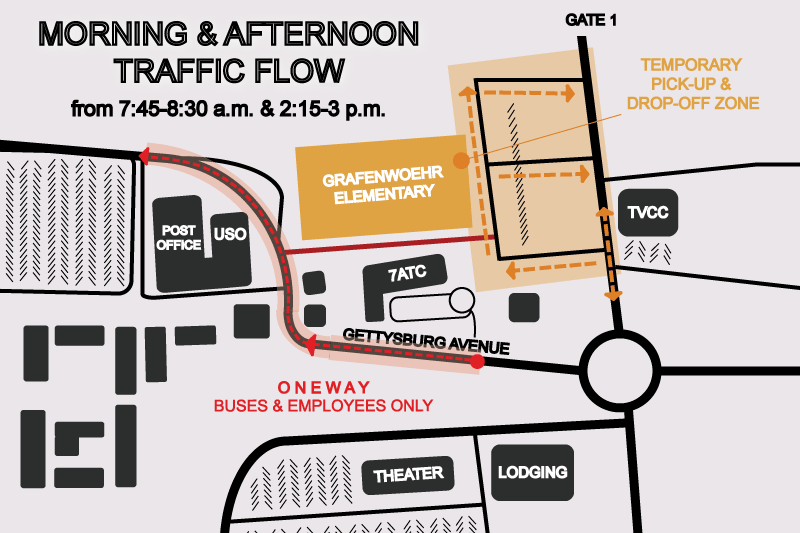 Parents should navigate toward the residential zone near Gate 1 (see map) and follow directions for all student pick-up and drop-off. 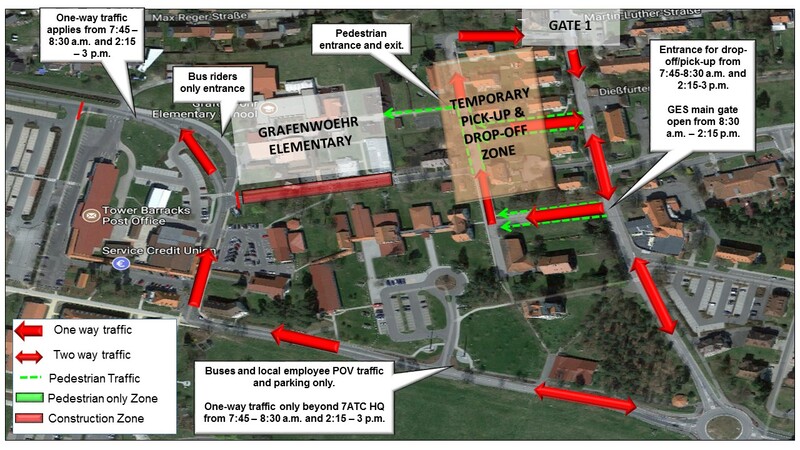 The GES side entrance, located on the east side of campus (near the basketball courts and playground) will be the only available pick-up and drop-off location during the closure. Short-term parking in the immediate area of this entrance is available. Community members visiting banks or the Post Office should park in overflow parking lots behind the Post Office. These parking lots are NOT for student pick-up and drop-off. We apologize for the inconvenience. We cannot delay this project as the safety of our children and the security of the installation is our top priority.